Hey all!! So it’s that time of the week again for another passion blog! Now, I’m sure everyone has seen the very famous children’s movie Finding Nemo and have fallen in love with the very large and chiiiiiilll turtle Crush. Many people may not know, but Crush and his family are part of the Green Sea Turtle species and are actually endangered. Something really interesting to throw in is that 1 out of 6 animals that are shown in the movie are endangered! These very well-known Green Sea Turtles, also known as Chelonia mydas, are in fact named for their color. Their shells are normally a brownish color but their cartilage and fat of the skin is what makes their name. This species of sea turtle (yes there are more than one!) are the largest and the only herbivores. Amazingly, this animals can live a life of up to 80 years and can grow as long as 5 ft weighting 700 lbs! Imagine swimming next to these green sea creatures! Their small heads are actually not proportional to their large body so they cannot, like many people think, pull their heads into their shells like other turtles. 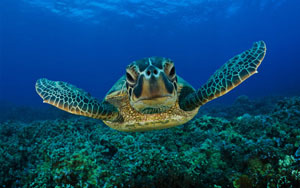 Green Sea Turtles are found to live on the shores of Europe and North America as well as the coast of Alaska and Chile. They must keep warm in the deep cold sea by swimming near the surface of shallow waters. Sometimes they may even swim out of the water, especially the Eastern Pacific green turtle, and bask in the sun to warm up. Every 2 to 4 years, Green Sea Turtles will migrate away from their feeding sites to nesting grounds. These nesting grounds are in a way past down. A female will use a specific beach area that their mother used to hatch them. After digging a hole in the sand, mothers will lay around 100-200 eggs! The number is so very high because after baby Green Sea Turtles are hatched they must take the dangerous journey from the nest to the sea. This truly is the most dangerous part of their lives as many predators prey on new born hatchlings as they make this short, but critical, journey. As amazing and adorable these animals are, they are still endangered. Hundreds of thousands of Green Sea Turtles are killed accidentally in shrimp trawl nets, in fishing gillnets, and longline hooks. It’s horrible because sea turtles need to reach the surface and breathe, but when trapped from fishing accidents, known as bycatch, they drown. I didn’t realize until I began to research but Green Sea Turtles are in fact hunted for their meat! This is a very large threat to the species as well as egg harvesting with numbers close to tens of thousands of green sea turtles are harvested each year! No wonder the numbers are dwindling! Like many other endangered animals, a large contributor to their endangerment is habitat loss. Green Sea Turtles need beaches to nest in and due to humans with development on beaches, the beaches they use are being disturbed and destroyed! We want our lovable Crush and his family to stay around for as long as we do! But this again means changes have to occur around the world. These changes are what we need to help in the survival of the many endangered species around the world. 1 in 6 animals in that movie are endangered?! That is the saddest thing I’ve read. I love sea turtles. They are really beautiful and unique animals. I’ve heard that one cause for their death is pollution of sea water such as plastic and cans thrown in water. It’s also so sad that they get caught in fishing nets since they mostly inhabit the surface of the sea. There should be a lot more efforts taken for the conservation of beach areas and controlled fishing/hunting. People need to see how amazing these creatures are and just how threatened they are by our wrongdoings. Loved the pictures! Great post! Wow, for as much as I love the movie, I didn’t know that that many of the animals in Finding Nemo are endangered. The fact that they are 700 pounds is just mind boggling to me! I couldn’t imagine being so close to something so big!!! And I found it interesting that they cannot pull their heads into their shells to hide…guess that’s a turtle stereotype that we have just all become used to. The poor little turtles getting caught up in the by catch… we should learn to be more careful when it comes to things like that to keep as many of these incredible creatures that we can around for as long as possible! Probably hands down one of the cutest creatures I have ever see. Their eyes are just so adorable. I just can’t Jenny. I had not idea they could grow to be as big as 5 feet long. Thats insane! Once again, I don’t understand how we can be so cruel to animals that are so precious. All of your posts are getting me really passionate about doing something to help these endangered species. People don’t seem to understand how quickly they can just disappear in the blink of an eye. I mean who wouldn’t want to help animals out as precious as these? !